What’s one of the best ways to improve your quality of life? Having more money. Because having more money means you can get out of debt, save towards passions, spend and invest, take trips, and have a security of mind. That’s ideal. It’s what we all want when it comes to living. We want to be able to save up for dreams and not have to worry. And an emergency fund can give us just that. So here’s how. We all have dreams, huge and small. Ours is to travel long term and have more amazing experiences abroad. Now yours might be bigger or not as big. You might want to finish college, be debt free, move to another state that you love, own a home, retire, or even own your own business. So whether this is a short or a long term goal, a big or a small dream, you’re going to need money. So how does an emergency fund help with this? Well let’s just say you’ve already been saving up for this dream/goal of yours. You’re almost to a grand, just over, or well past it. And you’re proud of the progress you’ve made. And then an emergency happens. The car decides that it wants to start having problems, maybe a series of problems which decreases your dream stash quickly. Or you or a loved one winds up in the hospital because of a car accident. Oh and let’s not forget house troubles. Now that dream stash has suddenly been turned into an involuntary emergency fund. And even if you have insurance for a car crash or a hospital visit, a lot of the time there’s going to be a deductible. So that might mean you’ll have to pay a grand or more on the car. Or a couple grand on your spouse who who needs immediate attention. Now you might think that any money that you get should be set back for your dreams. Especially when you’re not making much already. After all, what we want to do in life should be first priority. And it’s true, but creating an emergency fund will help ensure that those dreams actually become reality. In the last couple of years, I was told of the Dave Ramsey strategy . I had heard of him before, but I wasn’t very familiar with his teachings. What I learned was he taught that before you started paying off debts, you should have $1,000 setback for an emergency fund. Reason being that if an emergency happens and there’s no money saved, any cash spent on the emergency will go right back onto the cards you’re trying to pay off. Makes sense right? And once your debt is paid off (if you have any), you can build it up to have 3-6 months worth of living expenses by putting back the amount you were paying debt with monthly. Because job layoffs and serious illnesses happen, and it’s best to be prepared. Now when I talk living expenses, I mean what you actually need to get by. Don’t factor in for coffee runs or eating out. Only what you need. It’s optional, and it may take some time, but it’s definitely worth looking into how much you’ll need to get by for three to six months. Usually if you have to question it, then it means it’s not an emergency. Emergencies are things that pop up unexpectedly and couldn’t be planned for. Hence why you need a fund for things like that. They require immediate attention. If you see something ahead of time that could have been saved for, whether it’s Christmas, a trip, wedding, or even an anniversary, it’s not an emergency. But let’s say an unexpected bill comes up. Go over your bank account, see how much you have, and then decide whether can squeeze by until the next paycheck. And make sure you know the things you can do without. Cut what is unnecessary so that the emergency fund doesn’t get cut down. Cutting Food Expenses: Now we talk more about this in our post, How We Eat Better For Less, but one of the best ways you can save money, but still eat great, is to meal plan. We found that eating out was almost always unplanned because our meals never were. So when we knew that we had an amazing meal planned that night, we didn’t want to go out, which helped us save a lot of money every month. And even if you don’t eat out often, you should still meal plan before going to the store. Otherwise, taking a trip to the store will cost you a lot more than necessary. If you can save anywhere from $300-$500 a month, then cut out or cut down the restaurant trips until you’ve reached a grand. Ask Your Boss: I was told by a very wise person that you’re not making money until you’re making overtime. And it’s true, especially when you’re living paycheck to paycheck. Approach your boss and ask if you can put in overtime or even fill a few shifts. Track Your Spending: When saving, you need a game plan. Don’t just check your bank account once or twice a month and wonder where all the money went. Setup 2-3 days out of the week to track your spending and see where it goes. Usually banks will give you a chart or graph that shows you where you’re spending your money. Look at the last few months and see where your biggest expenses have been. It can be especially easy to overlook the small things like the occasional meal/drink or item purchase. But when they add up, they end being a big money waster. Find where the money is going and know what needless things your money is being spent on. Then find different ways you can cut out that spending. One of the ways you can do this is every time you’re tempted to get a coffee or go shopping, take that money you think you would have spent on the item(s), and put it away in a savings account or a safe place in your house. Then you can watch the money stack up in your favor instead of being a drain in your account. Withdrawal: Every month that you’re saving for this, you want to live as if you were being paid less than you are. So if you’re making between $1-2,000 a month (or less), decide what you can do without, cut the unnecessary spending, and decide on a percentage you want to live off of. Then have an automatic withdrawal into a separate account. That way what you’re saving is out of sight out of mind. Because isn’t it so easy to spend something if you know it’s just sitting there? Know What You Deserve: It can be so easy when we’ve been saving and not going out to tell ourselves, “I deserve it.” And it’s true, you do. But it’s not that immediate gratification. You deserve to see dreams and goals being reached and achieved. You deserve to eat in a restaurant in Asia or Europe, not the restaurant down the street. Always make sure that after you take from your emergency fund, you’re doing whatever you can to replenish it so you’re not starting from zero again. You want to keep yourself constantly aware of the dream you’re working towards. Always make it a conscious part of your thought process so that you can see the bigger picture and not just the here and now. 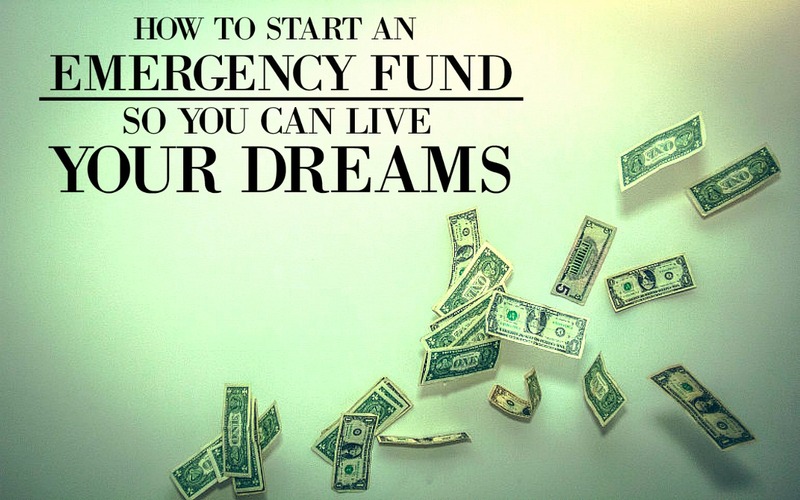 And know that having an emergency fund is a great way to build a protection around your dream so that if something does happen, you’re not watching all of that hard earned money go towards a car repair instead of your future. I hope this was helpful for you, but if there was something that wasn’t answered or you have some tips of your own, let me know in the comments below or email me! I’d love to get back to you and hear you out! This article was so very helpful mentally. Just reading it has inspired me to remind myself I deserve MORE. I have been struggling so bad and now that I have a child it is my sole motivation to SAVE and GET AHEAD. I would really appreciate some more advice and guidance.